But before the bad ideas, let’s check out something better from Mark Glennon. Chicago will have a new mayor in eight months, and the interim presents a big opportunity for reform. Toward that end, is it naive to hope that Rahm Emanuel will embrace a new role—as a reformer and truth teller? Maybe not, because it’s also his last, big chance to help his successor and to improve how history will record him. For starters, his annual budget address is coming next month. It usually sets priorities for the coming year beyond the budget. From the list of dozens of reforms needed to turn Chicago around, why not embrace at least a few of the easy ones? Like ending Ald. Edward Burke’s workers’ compensation racket, fixing the rigged calculation of prevailing-wage laws, ending the pension pickup for Chicago schoolteachers and five-year labor deals with automatic pay increases, and banning officeholders doing property-tax appeal work. And how about closing more schools? Seventeen schools hardest hit by dropping enrollment now run at just 20 percent of capacity on average. It’s politically hard to close schools, but Emanuel is now free to explain why there’s no choice. So, all very good ideas. Why not go whole hog? Because… maybe… he wants to get his beak wet via his political connections. Emanuel inherited most of Chicago’s problems. However, he did little to halt the plunge and did absolutely nothing to end the city’s culture of corruption. This is his chance to earn at least a few positive footnotes in the history books. He is going to do no such thing. But it would be a nice thing to do for his successor. The meanest thing to do is to lard on the bad ideas… and boy howdy, are they doing that right now. I wrote about two of the bad ideas below earlier (UBI and POBs), but let’s revisit as it looks like they really are gonna go through with this crap. Embattled Chicago Mayor Rahm Emanuel is forming a task force that will analyze whether the city should establish a so-called “universal basic income” program, as they Mayor seeks to salvage his legacy – currently associated with Chicago’s horrendous murder rate and broken pension system. Emanuel announced he would not be seeking a third term in next February’s elections. The task force set up by Emanuel will consist of a panel that will decide whether the welfare initiative could work, as the city wrestles with a $71 billion debt load, nearly $40 billion of which is pension debt. Of course, to give Chicago’s entire population of 2.7 million a check for $500 per month would cost $1.35 Billion per month, or $16.2 billion per year. Considering the city’s $71 billion debt load – of which around $40 billion is pension debt, UBI would add nearly 23% per year to that ticking time bomb. Hell, when you’re that indebted, what’s a few more billions of dollars? A new study by the Cato Institute in Washington, D.C., takes a state-by-state look at the value of the welfare benefits package. While no one in America receives welfare benefits from all 72 federal welfare benefits programs that provide direct cash or in-kind assistance, long-term welfare beneficiaries are more likely to receive benefits from multiple programs. Now, that was for a single mother with two kids – they were trying to make it comparable across states. So, maybe that $19,442 is higher now, but if you do $500 per person in the family (and you really want to provide incentive to have more kids? You get $500 per month more for each?) – then that’s $18,000/year cash. Given one may not particularly like the non-cash benefits now, I can see $18,000/year in cash be more attractive than $19,442. Also, I can see those who don’t qualify for welfare now would be very happy to get an extra $6,000/year. They just need to make sure they don’t get hit with $6,000/year in additional taxes. That would be a trick. There is a growing consensus across the political spectrum that our current welfare system is not working as intended. Although federal, state, and local governments spend nearly $1 trillion annually on at least 126 anti-poverty programs, we are doing little to help the poor get out of poverty or become self-sufficient. It is not surprising, therefore, that there is a search for a better alternative. Among the ideas that have been gaining traction recently are proposals for some form of a guaranteed national income (GNI). Those proposals can take a variety of forms, including a universal grant, a negative income tax (NIT), or a wage supplement. The case for replacing the current welfare system with a guaranteed national income is intriguing. It promises an anti-poverty effort that is simple and transparent, that treats recipients like adults, and that has a better set of incentives when it comes to work, marriage, and savings. In theory such an income could be set high enough that no American would live in poverty. But what sounds good in theory tends to break down when one looks at implementation. There appear to be serious trade-offs among cost, simplicity, and incentive structure. Attempts to solve problems in one area would raise questions in others. More specifically, given the track record of Chicago and finance…. I’ve written about this a lot, (POBs are OF THE DEVIL), so let me just link to other commentary. Commentary: Will Emanuel put Chicago taxpayers at even greater risk? If you follow politics in this city and state, you’ve experienced elected officials debating dumb ideas. Like when the Chicago City Council passed a resolution exonerating Mrs. O’Leary and her cow. Or when the Illinois House declared October “Zombie Preparedness Month.” Or when Chicago aldermen pushed for a ban on energy drinks except for coffee because Ald. Ed Burke, 14th, likes it. Consequential policy decisions don’t get a full and complete airing. The latest loopiness: The City Council, guided by Mayor Rahm Emanuel’s budget office, may be asked to decide whether to borrow $10 billion to shore up the city’s pension funds. So far, there has been little public debate and no committee hearings on the notion, which Emanuel’s team hasn’t formally proposed. Meanwhile, the council has spent weeks — years, actually — analyzing the pros and cons of horse-drawn carriages. For straight talk and solace, I turned to my Twitter friend, Jane the Actuary. She’s actually Elizabeth Bauer, who lives in a Chicago suburb, and blogs on government financing and the Roman Catholic Church, and writes for Forbes. Trust in Jane the Actuary. Yup, you should trust Jane. Reporter 2: Hang on. There are several things I don’t get here. How can the city borrow so cheaply? Moody’s rates Chicago bonds junk. Did we get upgraded or something? 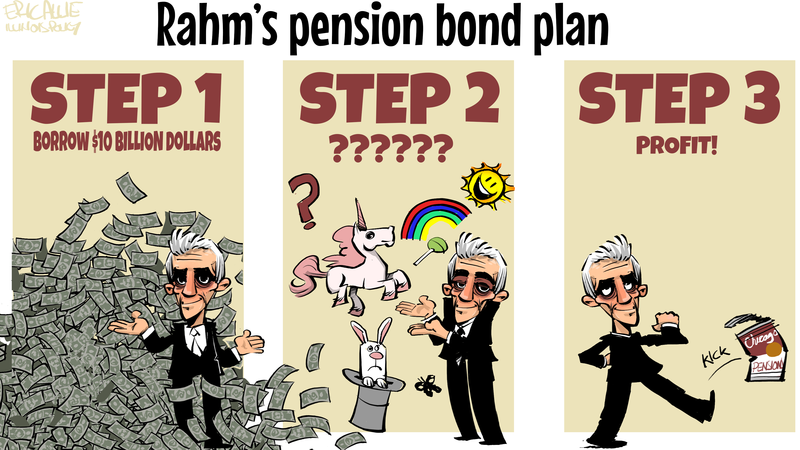 Emanuel: Our bond ratings are poor right now, so we can’t borrow the normal way – by issuing general obligation bonds. The interest rate would be way too high, plus we probably couldn’t raise the full $10 billion. Instead, we plan to use our new securitization structure. It’s complex, but it’s clever. Here’s how it works. To entice lenders, the city gives them special collateral by selling them some of the city’s assets – some future tax revenues. The structure makes it safe for lenders and it protects them in the event of a Chicago bankruptcy. The bondholders want this type of deal, so the bankers give us lower interest rates. Reporter 2: Wait, you’re selling-off assets that belong to the public? Like the revenues that could be used in the future to fund basic services like roads and police and health services? That means the bankers would have ownership over those future city revenues. And if the city gets in real financial trouble in the future, the bondholders would have priority over Chicagoans when it comes to accessing that money. How is that good for Chicagoans? Emanuel: That’s the beauty of the deal. The bankers and bondholders get what they want – much better security – and we get a lower rate. That’s how we get access to “cheaper” money to put into the stock market. Reporter 2: Sounds to me like you are selling the city’s future – its public assets – and then gambling with the money. So, the $6 billion in “savings” is predicated on an artificially-low borrowing rate and then playing the stock market? Emanuel: Yes, but it’s a no-brainer. Nobody has come up with a better plan, so we need to take advantage of this structure. The bankers and lawyers are ready to go. - Will the administration allocate the full amount of the pension obligation bonds to the pension funds, or will a portion be used to offset the prescribed ramp up in contributions from the annual general fund? - It appears that these are GO bonds without a dedicated revenue source beyond the yearly budget, is there a plan to cut the current budget/raise revenue/or change the structure of the debt payments to afford in the immediate term the new debt service? - This is the largest bond deal on the municipal level in recent memory and will double the city’s debt service, what do you expect the market appetite will be for something this large? It was a high-risk investment. Allison S. Davis — who once headed a small Chicago law firm that gave Obama his first job out of Harvard Law School — and Daley nephew Robert G. Vanecko even warned in the prospectus that the pension funds could lose their entire investments. Regarding your article on “Chicago’s Pension Fiasco” in Sunday’s paper, when this deal was first reported a “dozen years ago,” I thought it did not seem very financially prudent for the five pension funds to invest millions of dollars in a newly formed realty firm with no history. Besides, the involvement of Mayor Richard M. Daley’s nephew, Robert Vanecko, surely raised some red flags. I also wondered if the investments were made to gain favor with the mayor or was the mayor pulling strings behind the scenes. No matter what, we are paying the price for such bad decisions. I want to remind that the word nepotism originated in medieval clergy giving their nephews positions/business (of course, some of those “nephews” were actually sons) — maybe the city should not be doing business with the relatives of elected officials? I know it’s not the Chicago way, but ya gotta start somewhere. To be sure, there is a crowd running for Chicago mayor — but I would have thought Chicago has had enough of Daleys, and the Daleys have had enough of Chicago. Bill Daley has been a lawyer, banker and rainmaker. He has managed companies and national political campaigns, served as President Bill Clinton’s commerce secretary and President Barack Obama’s chief of staff. Now, the one-time JPMorgan Chase & Co. executive wants to run the nation’s third-most-populous city at a time that it faces serious financial challenges and stubbornly high rates of violent crime. Daley’s entry was already drawing jabs from other candidates. The candidate field looks likely to grow even bigger. Cook County Board President Toni Preckwinkle will announce this week that she, too, will run for mayor, the Chicago Tribune reported Monday after Daley’s announcement. In some of the cases of the candidates out there, I think they just don’t understand how little money they will actually have to play with. For instance, Daley said he’s going to count hard on J.B. Pritkzer—”I have no doubt he’s going to be our next governor”—to help the city deal with its huge pension debt, which already has forced up local taxes roughly $1 billion a year and could force another increase of that size by 2023, when the city is supposed to be at the actuarial funding level. Pritzker has already piled up his spending plans so high that they already top $10 billion by my rough guesstimate. If Daley’s solution is a state bailout, it’s magic beans. AND ILLINOIS PENSIONS ARE ALSO SCREWED. I haven’t done an update on the state of Illinois pensions recently, but… they are better off than Chicago plans, but only marginally. I present without comment (other than that subtitle). Wilson made the comments on AM 560’s Morning Answer show Friday with Dan Proft and Amy Jacobson. Well, that’s one way to get press in a crowded race, I suppose. Chicago could be the latest municipality to face diversion of state money as a result of a pension intercept law that took full effect in 2018. Under that law, municipalities that fail to make full contributions to their police or fire pension funds can see state money meant for the local government diverted directly to the pension funds instead. According to The Bond Buyer, the Firemen’s Annuity and Benefit Fund of Chicago filed two claims with the Illinois comptroller for a combined $3.3 million shortage, alleging the city shorted it by $1.8 million in 2016 and by $1.5 million in 2017. While these are relatively small amounts for such large pension funds, there is no ignoring the city’s enormous pension problem and its crowding-out effects on core services for residents. Bond Buyer reported that the city will likely contest the fund’s claims. The amount of the full, or “actuarially required,” contributions to municipal pension funds each year is determined by either the Illinois Department of Insurance or an independent actuary employed by the pension fund or municipality. Under the pension intercept law, the Illinois comptroller must withhold state funds owed to a local government once a pension fund makes a claim for pension payments owed. For most municipalities, the comptroller can intercept all money owed to local entities from the state – including sales and income tax collections on behalf of municipalities – but for the city of Chicago, the comptroller can only withhold grant money from the state. CHICAGO – Chicago is the latest Illinois city to find itself facing the diversion of state funds to make up for pension contribution shortfalls. The Chicago firefighters’ pension fund has joined the list of retirement systems triggering a state law that allows for the diversion of state-related funds to make up for the shortfalls. Chicago denies it owes any money to the fund. The Firemen’s Annuity and Benefit Fund of Chicago filed two claims for $3.3 million. They accuse the city of a $1.8 million shortage, plus interest, in its $199 million 2016 contribution owed under state statutes and a $1.5 million, plus interest, shortage in its $208 million 2017 contribution as of Sept. 1, according to the letter submitted to Comptroller Susana Mendoza’s office. In Chicago’s case, the comptroller can only intercept the city’s grants from the state government; state-collected funds such as sales taxes are off limits. “The board of trustees has a fiduciary duty to ensure that all monies due and owing to the fund are contributed to the fund consistent with the requirements of the Illinois Pension Code. On behalf of participants and beneficiaries, the board of trustees will continue to take all necessary steps to fulfill that duty,” firefighters fund board president Daniel Fortuna wrote in an emailed statement. The firefighter plan is in the worst condition. It makes sense for them to be the first to grab for funds. Towns and cities across Illinois all are now subject to similar intercept if they fail to make pension contributions in amounts required by state law. Under the intercept laws, pensions can request the Illinois Comptroller to seize the shortfall out of money that ordinarily flows from the state to the municipality including, most importantly, the municipality’s share of sales taxes. In the case of Chicago, however, only grant money flowing from the state to the city can be intercepted for pensions, not sales tax. But Chicago has already sold ownership of all future sales tax that it collects through the state (which comprise about 92% of its total sales tax collections) to an independent entity as part of the new, “securitized” approach to selling bonds. In other words, Chicago’s sales tax revenue from the state has already been hocked to pay bonds, though the city does retain residual rights to cash not needed to make the bond payments. The list of municipalities selling future revenue in that manner is likewise growing. Riverdale and Bridgeview sold similar securitized bonds. Oh, yeah, this is gonna be a mess. Could we recognize that Chicago is actually bankrupt, please? They are unable to make full pension payments, and have already sold off future tax revenue. My only main wonder is why there are so many people who think being the mayor of Chicago is at all an attractive position. From an individual point of view, that’s the worst idea of all. But I guess somebody has got to be the loser to take all the pain.